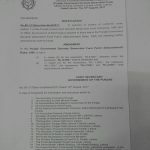 Cabinet Secretariat Establishment Division has issued Notification No. 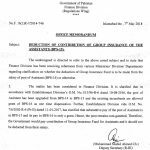 F.No.5-15-2011-Admn-II dated 3rd October 2013 regarding Notification of Amendment in Federal Employees Benevolent Fund & Group Insurance Rules. 2- in the aforesaid Rules. 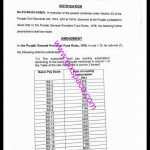 Sub-Rule )5): Every Employee shall pay a monthly subscription to the Benevolent Fund, in terms of section 12 (c) at the rates specified in column (4) of the Seventh Schedule and monthly Benevolent Grant in terms of section 13 (3) shall be paid in accordance with the scale prescribed in column (5) of the Seventh Schedule, with effect from 01-07-2013. 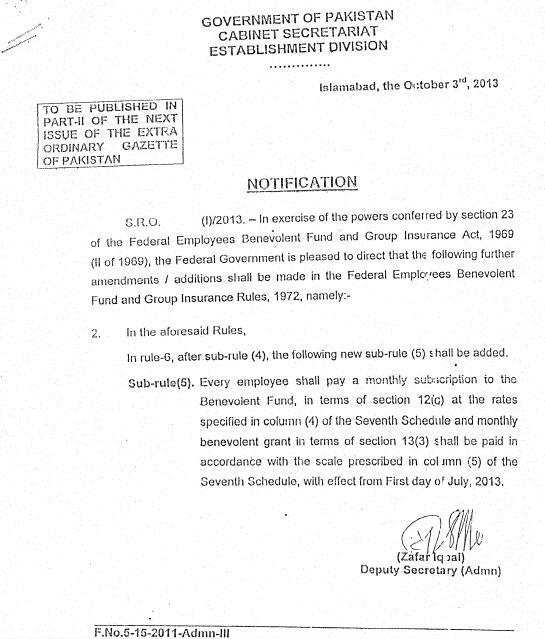 As far I have noted here that the Benevolent Fund deduction rates for the employees having basic pay Rs. 39,001/- or above have been fixed Rs. 960/- Per Month. 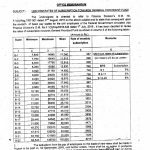 Earlier these deduction rates were unlimited vide the Notification No.18-22/Act-Amdt/Plan 2002 dated23rd November 2012. MAY I KNOW WHAT ARE THE REQUIREMENTS TO HAVE FEE REFUND FOR BS PROGRAMME. 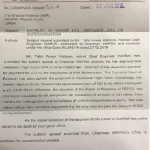 ALSO THE ATTACHMENTS i.e FEE RECEIPT, TRANSCRIPTS & AMOUNT. FEE SLIP/ TRANSCRIPT ORIGINAL OR COPY THANKS. MAY I KNOW WHAT ARE THE REQUIREMENTS TO HAVE FEE REFUND FOR BS PROGRAMME. ALSO THE ATTACHMENTS i.e FEE RECEIPT, TRANSCRIPTS & AMOUNT. THANKS. My father was died in 1993 during the service in federal govt. in BS-16. My mother got pension and BF. The BF amount is 2160/- kindly tell me this amount is increase or not. Thanks dear Ghulam Mustafa Bhatti for such informative comments and also thanks for appreciating mine efforts for the poor employees. Dear Madam, AOA. I need Federal Employees Group Insurance deduction rates which were admissible during 1993 to 1995 i.e. prior to the scheduled of January, 1996. If the same is available with you, the same may please be provided to me at the earliest. Dear Mukhtar Ahmad, I also could not understand the same. 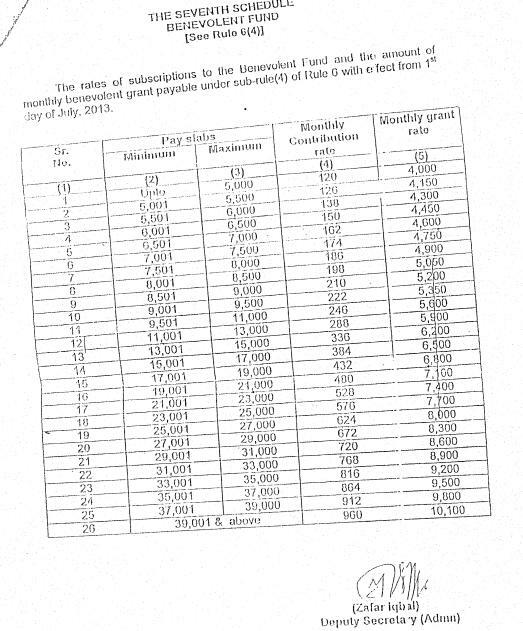 its related to family pension, after the employ of govt servant died then the monthly Family pension along with the Monthly Grant as per Chart Column 5th by Federal Employees Benevolent Fund & Group Insurance. 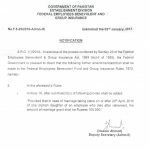 Monthly benevolent fund grant is given to family of employee who died while in service, invalid pension (medical grounds) or retired employees who died before attaining age of 65 years.